The fastest way to get between Pudong International Airport and downtown Shanghai is the maglev train. In fact, at speeds up to 430 kilometers per hour (267 miles per hour), the Shanghai maglev train is the fastest airport transport on the planet. Mag lev, short for “magnetic levitation,” is a system in which a series of magnets allow the train to actually levitate above the track and be propelled and slowed. This means that there are no wheels or rails and, subsequently, no friction. It is an expensive technology but one that, if the costs could be decreased, could have profound effects on rail systems across the globe. Interested to try this technology, Tawn and I decided to ride the maglev train to the airport for our departure. It was a short and fast trip, but one that required a taxi ride to the station in Pudong, the newer side of the city on the east bank of the river. The maglev station is connected to the subway system, but bringing your luggage in the crowded Shanghai subway is not a fun prospect. You could argue that, if you are already in a taxi, it would be faster just to keep driving to the airport. Once we arrived at the station, we found the system easy to use and the train ride itself was relatively smooth and, of course, incredibly fast! 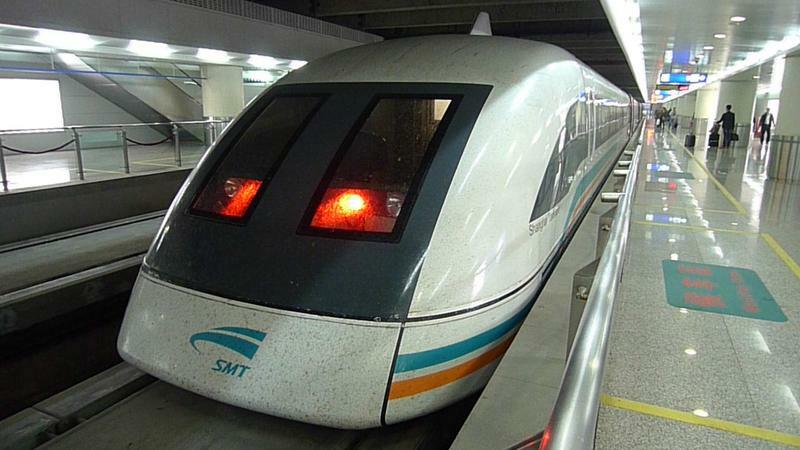 All in all, the maglev train is probably more useful if you are staying in the Pudong area or are traveling light enough to connect to and from the subway. Even if you aren’t, the maglev train is worth doing at least once, just for the experience. Does the magnetic field mess with things like compass and pace makers? I bet the field is massive. Sail on… sail on!!! How impressive! The platform and the train appear so clean and dazzling. Glad you were able to use the train Chris. @dreadpirate – No effect from the magnetic field that I know of. Otherwise, the equipment wouldn’t work correctly, would it? @ZSA_MD – The interior of the train was a bit shabby, actually. Lots of wear and tear, like the materials weren’t particularly good quality. Wow now that was a fasten your seat belt trip. Thanks for sharing this. @Grannys_Place – Sure wouldn’t want to be sitting there if it came to a sudden stop! Thanks for the recommendation. @Devilzgaysianboi – Can you imagine how convenient that would be for trips between SB and SF? I was surprised the interior is a bit shabby but I guess it’s been in service for quite some time. I wish we had something like this in Toronto. thank you for the train ride it reminded me of the bullet train from zurich to paris. you have a lovely voice, it was a treat to finally hear you speak. @grannykaren – Oh, thank you. There are several videos on my YouTube channel in which I speak! @ElusiveWords – Gosh, any sort of train service to the airport in Toronto would be a good thing. @grannykaren – I totally understand.